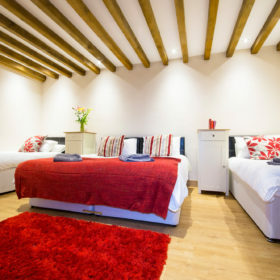 Clans, stags or hens will love Cambrian Retreat. 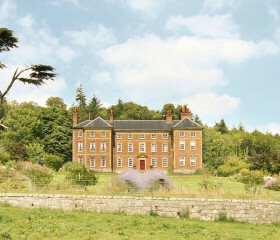 With space for 50 (including the Farmhouse), it’s huge, homely and a little hedonistic in the shadow of the Cambrians. 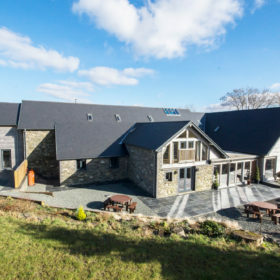 Watch the stars from the ten-man hot tub, get a game going on the full-size football pitch, spend late nights by the logburners. Chill, rinse and repeat tomorrow. Got a clan, stag or hen? 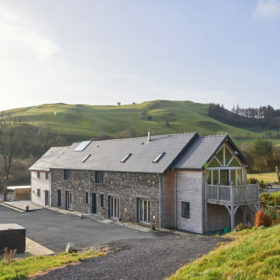 For parties of up to 38, and another dozen in the Farmhouse, Cambrian Retreat near Aberystwyth is huge, homely and slightly hedonistic. 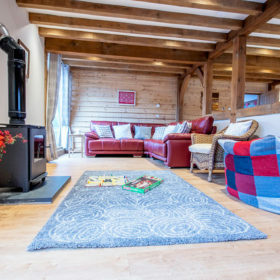 Get a game going on the full-size rugby or football pitch or sit in the ten-person hot tub and watch the stars, five of which fell to Earth right here. 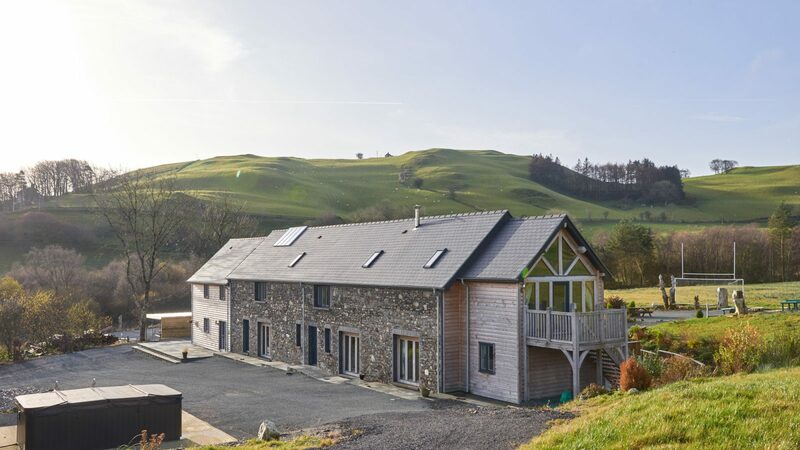 Outside, at the highest point of the Cambrian Mountains, the peaks rise theatrically all around, nudged by 13 acres of private grounds offering walking and biking trails, croquet on the lawn and a playground for archery or quad-bikes. Inside, luxury is laid on thick. 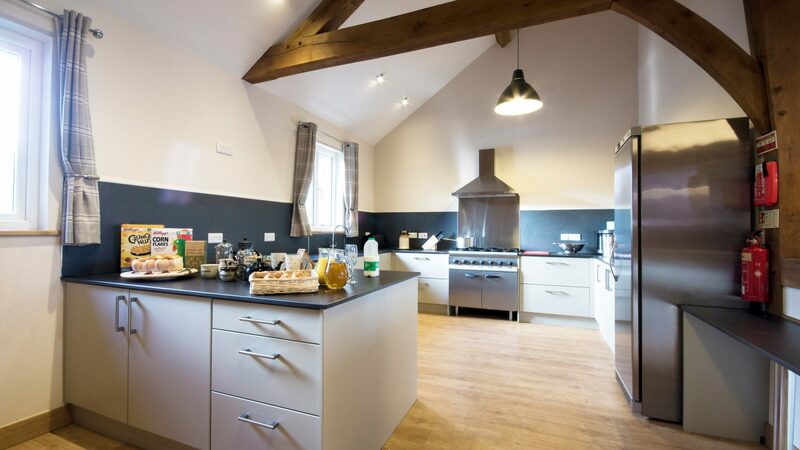 Divided into three suites, each with their own lounge, dining room and kitchen, Cambrian Retreat offers ten bedrooms, vast communal accommodation and the simple gift of switching off. You can do this in the vast central cinema suite or next door in the games room, with its American pool table. After late nights by the logburners, wake in your superking bed – did you bag the master suite with Juliette balcony overlooking the Cambrians? 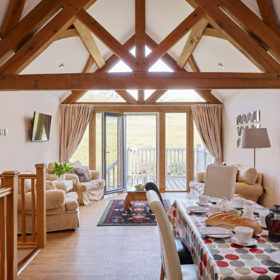 Lucky you – to see the red kites swoop and circle above their breakfast. 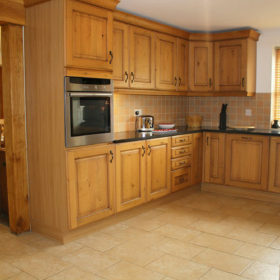 Yours is served in the huge kitchens, or out on the terrace in the clear Cardigan air. 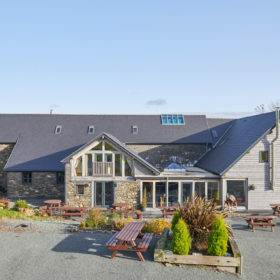 Bring your cars, bring a coach – there’s plenty space to park where the rolling Cambrian fells turn to hardstanding, here among 13 acres of private grounds filched from the Welsh landscape. You’ll share the silence here only with sheep, as you take to the hiking and biking trails that wend their way through the wooded escarpments. This is outdoors on a big scale: consider the full-size grass pitch with posts for rugby or football. With up to 50 guests, you’ll have no problem getting teams together. Wind down the adrenaline with genteel croquet on the lawn, outdoor table tennis, or pack a picnic for a jaunt down to the stream or lake. 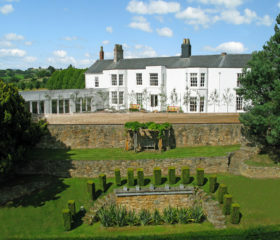 There’s even space for archery or quad-bikes, which we can arrange with a quick phone call. Out the back, picnic benches stand ready to receive the sizzling steaks beneath the rolling hills and big skies. 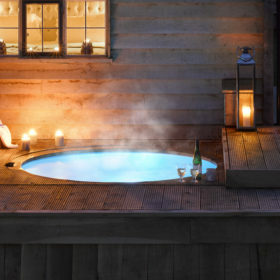 When they darken, pull on your cossies and climb into the ten-man hot tub to watch shooting stars paint their paths across the clear, inky blackness. Spread out among the sprawling spaces. Meet up centrally or just melt into a good book all on your ownsome. 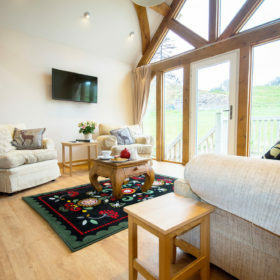 Cambrian Retreat comes split into three suites – Cambrian, Pumlumon and Barcud – each with their own living areas. Or you can get together in the central atrium and games room to mix and mingle. Get the projector out and fix up a film night in the atrium. Get around the piano for a traditional sing-song, or cue up a game of billiards, pool or table tennis. 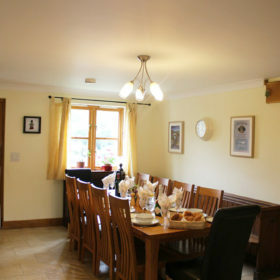 Spend long evenings with cards and coffee in front of the logburners in the Cambrian and Pumlumon suites. 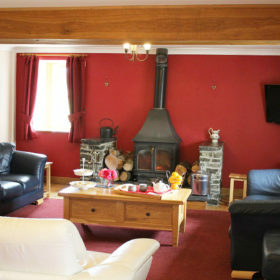 There are TVs in every communal area, wifi on tap and squishy sofas and chairs at every turn. 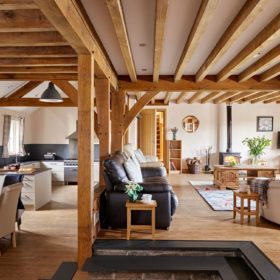 Vaulted ceilings, wooden floors and high oak beams give a sense of space and light. 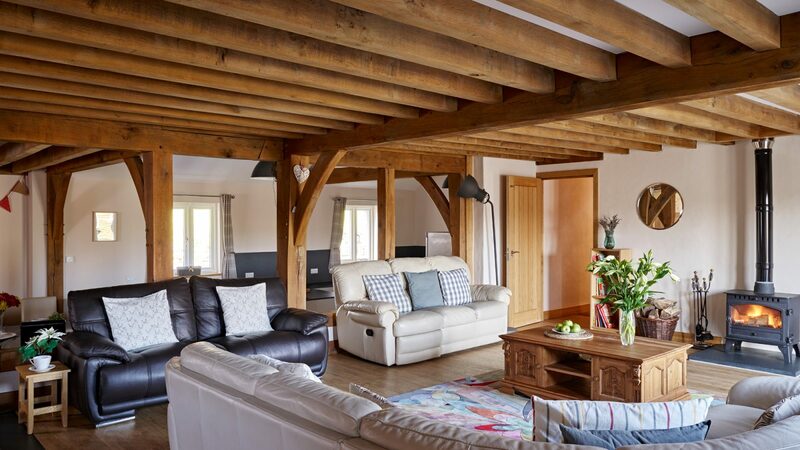 The living areas here want to help you relax, re-energise and recharge. Don’t let them down. 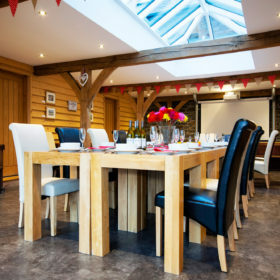 Come together in the shared spaces to review today and talk about tomorrow, with wining and dining for 16 in the Cambrian and Pumlomun, six in the Barcud and ten in the Farmhouse. Get together in your suite or dine among two dozen in the atrium communal entrance area. 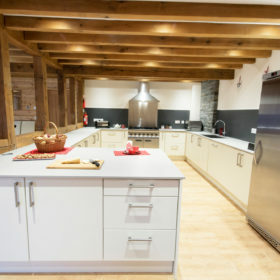 You’ll fix up your feast on the gas oven and hob in the Cambrian and Pumlumon kitchen areas and on an electric oven and hob in the Barcud and Farmhouse. Prepare fresh local produce yourself or call on our chef, put your feet up and enjoy an aperitif as you sit and savour the sun dipping over the Cambrians. 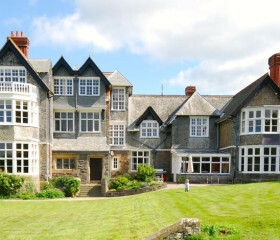 Just down the road in Devil’s Bridge, the Hafod Hotel offers bar and brasserie, sandwiches and a la carte that includes carrot-and-courgette burger and Welsh-cheese pizza. In Aberystwyth, Y Ffarmers offers local fare in the shape of Cardigan-Bay cod, Burry Port mussels and Penlan pork belly. Aberystwyth’s Druid Inn buzzes with a warm welcome and real ale from the Good Beer Guide, while Baravin is best for pizza, pasta, grills, cocktails and craft beers all served with a side order of sea views. On Marine Terrace, Gwesty Cymru’s the spot for 10-oz steak, or date and apple-stuffed pork tenderloin wrapped in Parma ham. 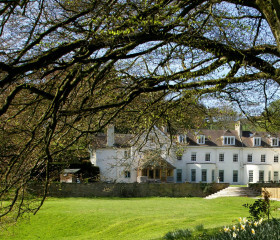 Accommodation for 50, or just a few? We’re flexible here. 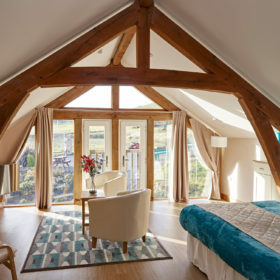 The 50 happens when you book the lot: the Cambrian Suite, Pumlumon Suite, the Barcud self-contained apartment and the Farmhouse; the few when you pick and choose. 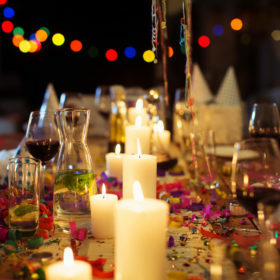 For celebrations, reunions, or stags and hens, it’s ideal. 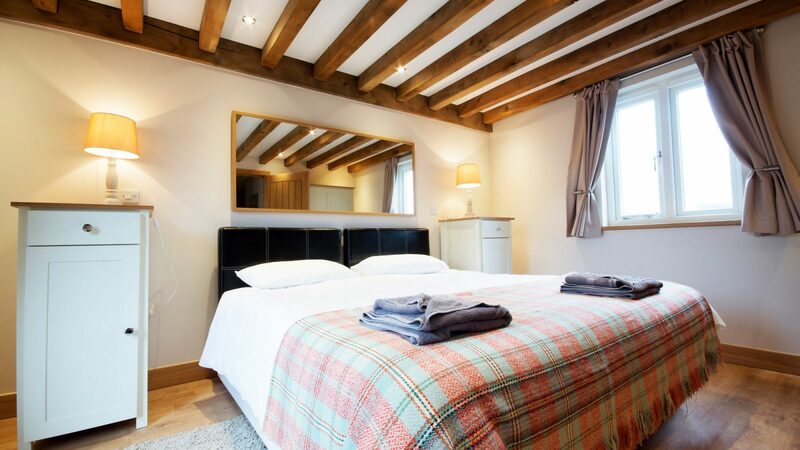 The Cambrian Suite comes with four en-suite bedrooms sleeping up to 19. Rheidol has a superking with bunk above; Rhos sleeps four in a superking with single bunk and one single; Village takes five, with a superking/ bunk and two singles, while Penlan sleeps seven in a superking and three singles with space to add two more. 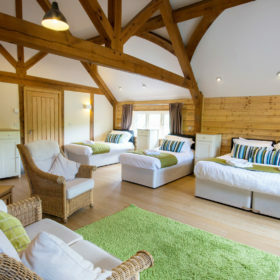 In Pumlumon, all rooms are en-suite. Isaf sleeps four in a superking ad two singles, while Heather features a superking, single bunk and single bed. 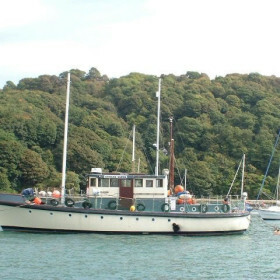 Vista sleeps six in a superking with bunk, super king and single bed, while the Cariad honeymoon suite for two (natch) comes with its own dressing room. 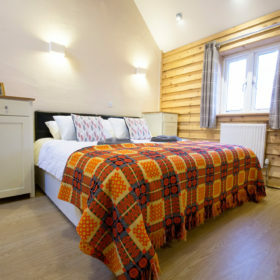 The shared-bathroom Barcud apartment sleeps six, with three in the Red Kite and two in the White Kite bedrooms. 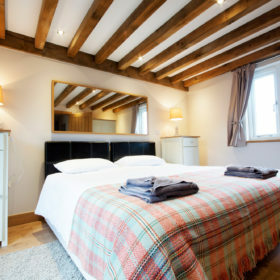 The Farmhouse sleeps 12: two in bedroom one in a superking, and up to three each in bedrooms two, three, four and five. Bedroom five comes with toilet en-suite. It’s off to New Quay for boat trips round the bay to spot bottlenose dolphins and porpoise. Or head inland for the red-kite feeding at Bwlch Nant-yr-Arian. 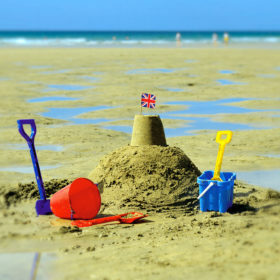 Pack buckets and spades for the lovely beaches at Penbryn and Mwnt. 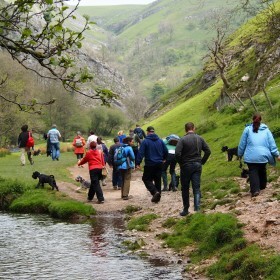 Walk to Plynlimon or potter down the road to see the falls at Devil’s Bridge.